Every living thing, our Texas trees require attention and proper care to thrive. 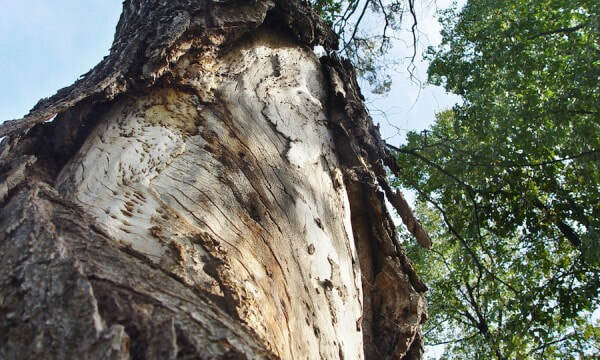 In addition to the often tumultuous weather and summer droughts, many diseases and insects take their toll on Texas trees. 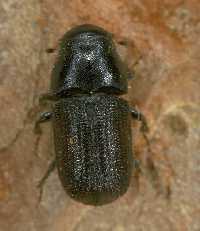 In fact, Pine Bark Beetles can infest a pine tree and kill it in a few short weeks. Entire forests have been decimated due to this voracious creature, and there are many insects equally as threatening. 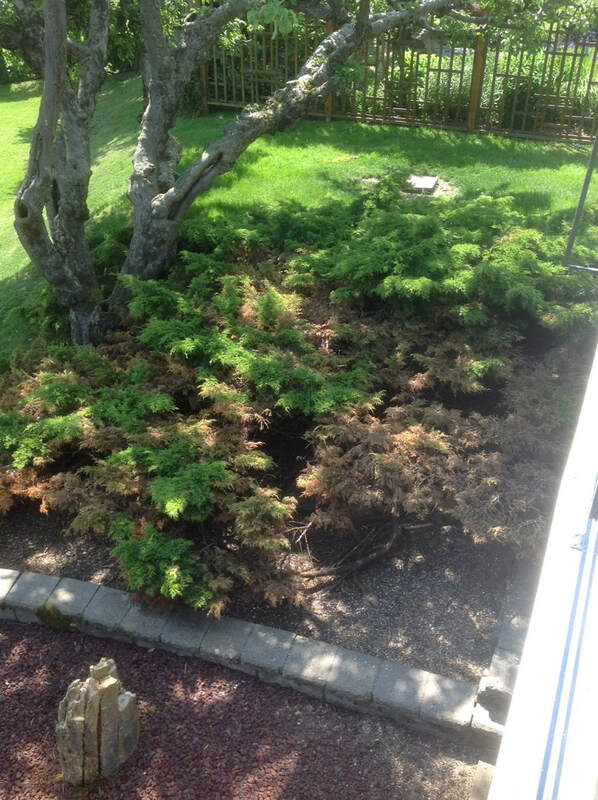 Our Arborists specialize in herbicide burn rehabilitation. Chlorosis or yellowing of leaves is a symptom that can be caused by many things. The best thing to do is call an Arborist for a professional opinion. Pine Bark Beetles infest Pine trees that become stressed. Keeping trees healthy is the best defense against infestation. Oak Gall is not fatal but can cause stability issues in the tree. Having an arborist examine the risk level of the tree should be a priority. ​Houston, Texas Arborist offers reputable, insured, custom services, tailored to the needs of your trees and your budget. 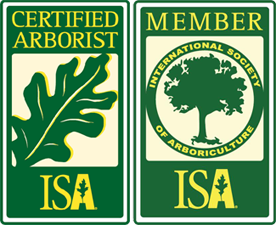 The Arborist will inspect your tree(s) and determine if it is possible for them to be saved. If salvageable, the most effective measures will be taken to eradicate an infestation, such as Pine Bark beetles. These insects are tiny, but, as stated, have the ability to decimate forests of pine trees in a very short time span; therefore, time is of the essence in taking action. Thousands of these small insects attack and feast on your pines, making saving them very difficult if not treated quickly. If you suspect you have this problem, or better yet, have your valuable trees examined by one of our skilled, well-versed, Arborists at 1-832-730-8733 to promptly schedule your Free Evaluation! ​It takes a commitment consistency to produce high-quality vegetation and plant life. These future crops are especially demanding when it comes to pest management because vegetation are attacked by many species of insects and diseases that must be controlled and maintain to have a successful crop. This publication provides information on how to identify pests and when to treat. It also includes a recommended spray schedule for disease and insect treatments based on stage of crop development. Ganoderma is a non-treatable fungus that can infect palms of all different species. Protect your trees before infection takes place to ensure and long healthy life. Installing a cabling system into a multiple trunk tree ensures stabilization and helps protect hardscapes from damage during natural disasters. 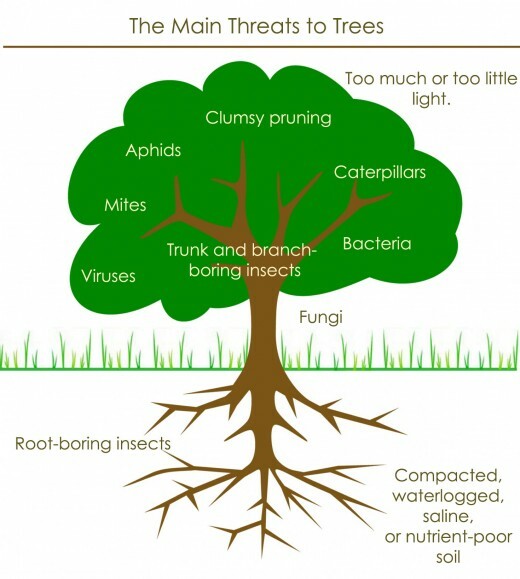 ​Houston arborist has developed specific pest management system for small-scale home vegetation. The insecticide and fungicide recommendations given here are based on non-restricted low toxicity use products that are readily available from local lawn and garden centers and sold in container sizes appropriate for small lawns. ​Brown rot is a serious peach disease, but it is not very common on plums in high humid areas like mississippi and Texas. The disease attacks many plant parts (blossoms, twigs, shoots, and fruit) from spring through harvest. Fungicides will help suppress the disease but control it only moderately when conditions favor the disease, especially in late season near harvest. Nonetheless, fungicides are almost a necessity in our climate. 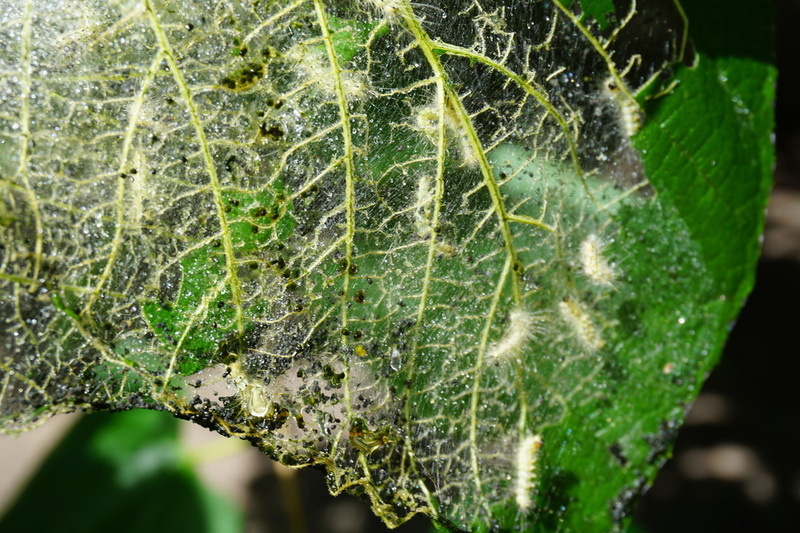 Fall Webworms skeletonize the leaves of trees that are infested. If infestation is not intervened, these tiny caterpillars can cause the tree to go into shock and ultimately kill the tree. Scale bugs which can be seen as the white powder that has infested this Sago palm can infest other species including Magnolia trees. Spraying to kill the bugs is crucial. ​The fungus that causes brown rot (Monilinia fructicola) overwinters in twig cankers, fruit mummies, and peduncles (stem-like structures that attach the flower/fruit to the branch). Removing these overwintering sites after harvest will reduce disease pressure the next season. 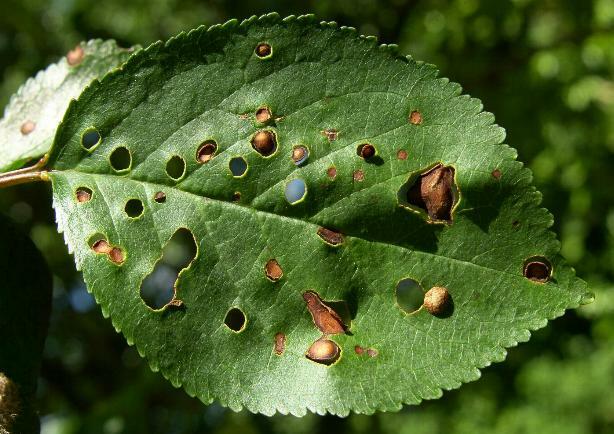 Shot hole is a fungus disease (Wilsonomyces carpophilus) that gets its name from the leaf symptoms—smallish brown spots that fall out, leaving a “shot” pattern in the leaf. The disease is present in many areas of the U.S.
​This fungus starts to cause problems during wet winter months when buds and twigs infected the previous season produce spores. The fungus infects and kills dormant buds. 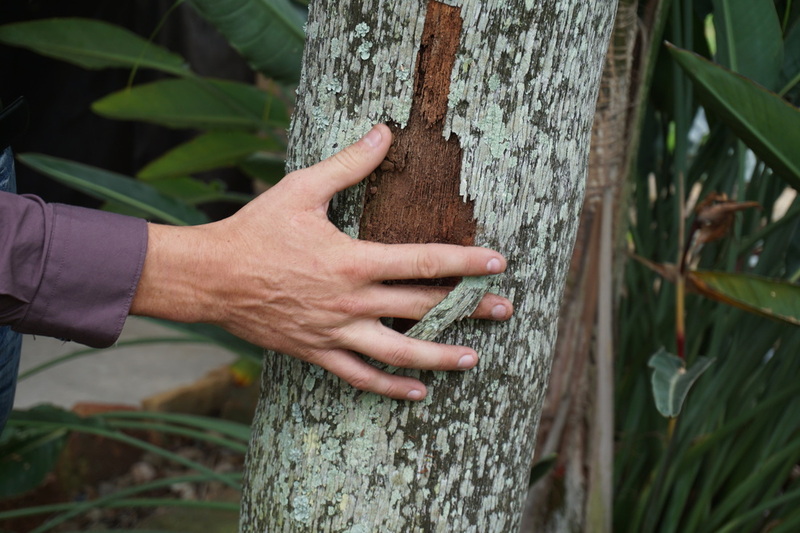 Some buds may have a varnished appearance, which results when tree gum seals the infection from the rest of the plant. ​Stem lesions range from about one-tenth to three-eighths of an inch in diameter. Leaf and fruit lesions start as small, purplish areas that expand and turn brown. All may have a velvety, brownish mass of fungus in the middle during moist and humid weather. When the weather turns warm, the leaf lesions will fall from the leaf, leaving the “shot hole” appearance. Fruit lesions will be on the upper (stem) side and will become rough-textured, almost corky. ​To manage this disease, you must protect the dormant buds. A single application of fixed copper or Bordeaux mixture before fall/winter rains provides winter-long protection. Growing shoots and fruits also need protection. A spray application immediately after fruit set is most common. Usually Captan is used because copper fungicides used at this time of year can cause plant injury (phytotoxicity). No resistant cultivars are available. As the name indicates, this disease is caused by a bacteria (Xanthomonas arboricola pv. pruni). It usually is very aggressive in the eastern United States because of generally higher humidity, wetter conditions, and longer dew periods than in the western states. Very susceptible cultivars cannot be grown here at all. 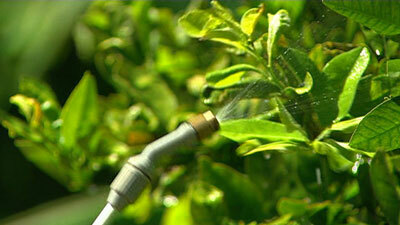 ​The bacteria depend upon free moisture (dew, rain, irrigation) to reproduce and for lesion growth. Rain driven by wind spreads the bacteria through the tree and among trees. Infections will be worse on the sides of the trees facing the winds that brought the infection. The optimal growth temperature is 75–84°F. The disease affects twigs, shoots, leaves, and fruits. Signs of deteriorating Leaf symptoms start as a water-soaked dark green spot that expands until it meets the veins inside the leaf. These leaf veins keep the lesion from spreading for a small time, angular lesions (lesions with sharp corners) about one-sixteenth to one-eighth of an inch are a key that bacterial spot is the problem. If warm, wet weather continues, the lesions may enlarge and merge. As the lesions age, the insides will turn from a water-soaked dark green to a light purple color. As the weather dries, the lesions may turn brown and fall from the leaf. 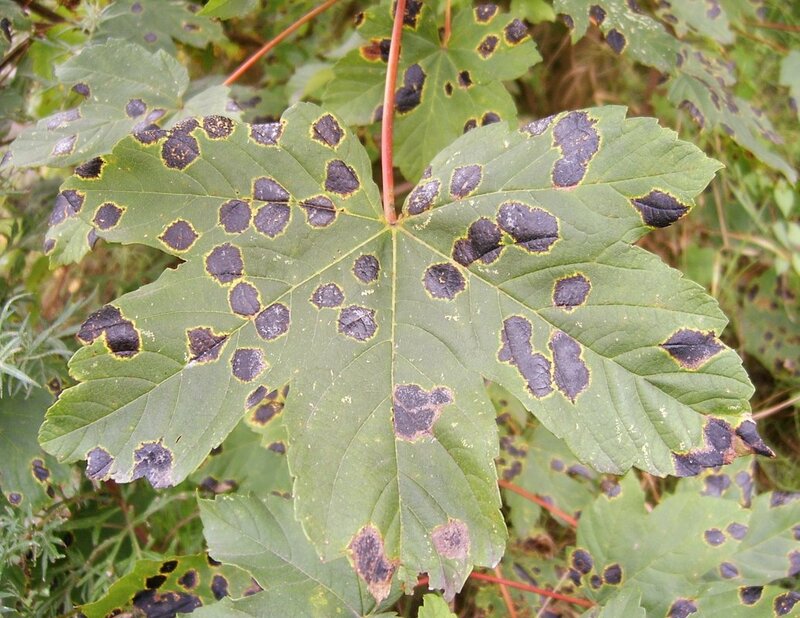 The lesions will be more common in areas of the tissue where water sits for any period of time, such as along the leaf midrib, on leaf tips, or along lower areas of the leaf margins. Leaves with numerous lesions may turn chlorotic (yellow) and fall from the tree. This bacterial pathogen usually enters twigs through leaf scars, which are places where a leaf has fallen from the twig. 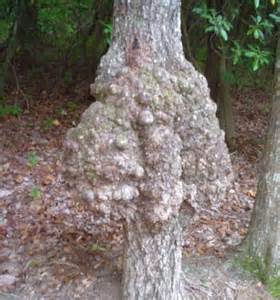 Lesions that develop on the previous year’s growth are called “spring cankers” or “black tip.” They were infected by the bacteria moving through the leaf scars the previous autumn. Spring cankers appear as slightly raised blisters. They can expand to as long as an inch along the twig. Black tip is confined to the terminal bud area of the twig. The bud fails to open, and a dark canker can extend up to 1 inch down the twig from the bud. The plum curculio, Conotrachelus nenuphar, is one of the most devastating insect pests of homegrown peaches and plums in gardens. The white, legless grubs are the “worms” so often encountered in fruit that has not been adequately protected. 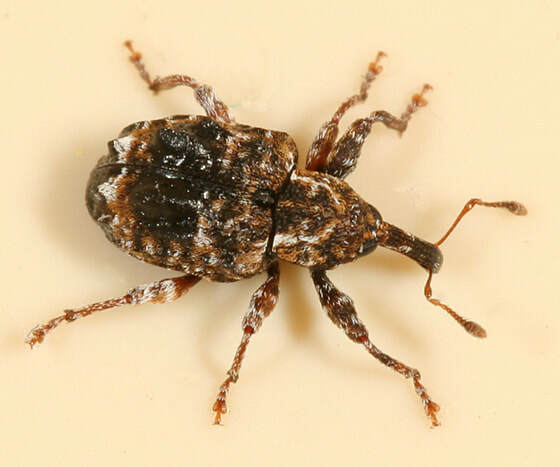 Adults are small weevils that overwinter in leaf litter and ground trash in or near the orchard. The adults become active about the time peaches begin to bloom. They fly to trees to feed on buds and newly set fruit; females chew crescent-shaped punctures through the skin of developing fruit to insert their eggs. Grubs hatch and feed inside the fruit until mature. Fruit that are attacked when small usually abort, but larger fruit remain on the tree with developing larvae inside. Picking up and destroying fallen fruit can help reduce future infestations. Mature larvae drop to the ground when they are ready to pupate. There are two to three generations per year. ​Successful control of plum curculios depends on killing the adults before they are able to lay their eggs in the fruit. Begin including malathion in cover sprays as soon as petals fall and apply on a 10- to 14-day schedule (tighten the spray schedule during rainy periods). Extending the spray intervals will result in reduced control. Tightening spray intervals to 7–10 days, especially for the first few cover sprays, will improve control. The first few sprays after petal drop are the most important because they target the overwintered adults that will lay the eggs for the first generation. Granulate ambrosia is a tiny beetle occasionally infest and kills peach and plum trees, as well as many other trees in the home landscape. Actually, it is not the beetle that kills the tree, but the disease it carries and inoculates into the tree where it burrows. These tiny beetles are less than one-eighth of an inch long, the beetles themselves are rarely seen. 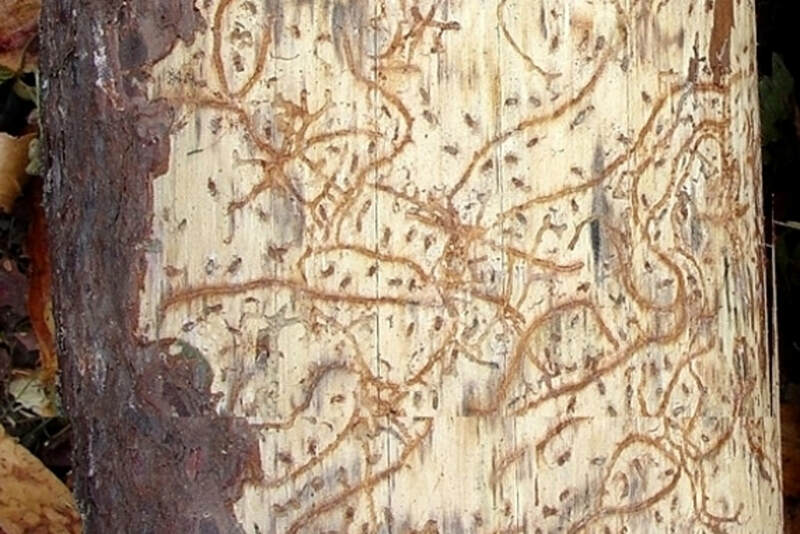 The sign to look for is the compacted columns of sawdust these beetles create as they bore into the tree. Except for the fact that they are often curved, these sawdust columns are similar to toothpicks in size and color. Keep an eye out, however, that this sign can be short-lived, as these sawdust columns are easily broken off by wind and rain and can go unnoticed leaving the tree to slowly die. 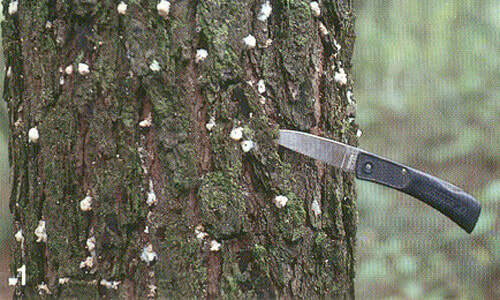 ​Even a half-dozen attacks is enough to kill a small tree, and there is no real effective rescue treatment. 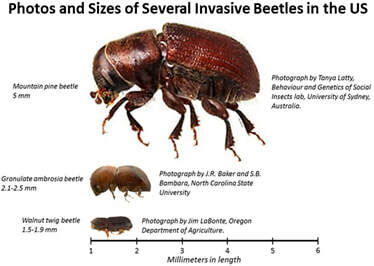 These beetles spawn several generations per year. Most of these fatal attacks to fruit trees normally occur in early spring, just as trees are leafing out. Beetles in general attack many species of trees and shrubs, but peaches and plums seem to be favorite to the Granulate beetle, targets, possibly because of pruning activities. Newly planted trees, less than 3 or 4 years old, are most susceptible due to the softness of the outer bark, Usually older trees with denser bark are also attack. ​Fortunately, granulate ambrosia beetle attacks are sporadic; they may kill two or three of your seven trees one year and not return for several years. In most situations, there is no practical treatment or response other than to recognize what killed the tree and to cut it down and burn the wood to prevent further spread. To treat preventively, mix permethrin according to label directions for a trunk spray and apply at 2-week intervals, beginning just before buds begin to swell and continuing until just before bloom. Spray to cover the trunk, scaffold limbs, and larger branches. 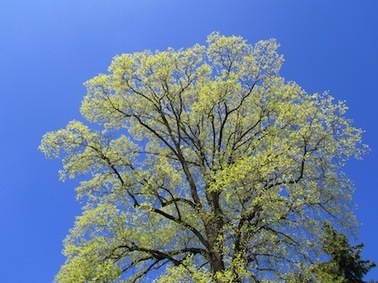 Trees less than 4 years old are most likely to benefit from such treatments. Note that sprays for ambrosia beetles must be applied much higher on the tree than for peach tree borers. ​Protect bees and other pollinators. 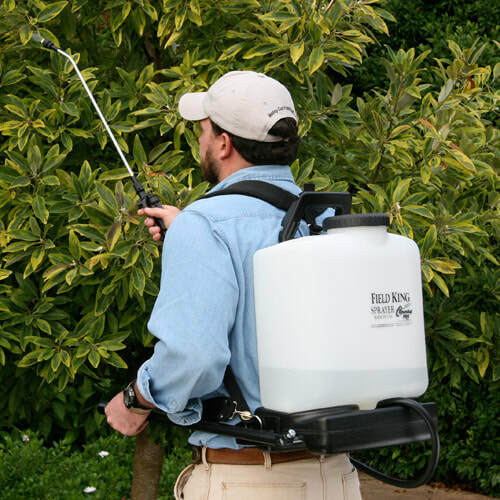 Avoid spraying insecticides while fruit trees are in bloom. There are no major insect pest problems to be concerned about during this period anyway. Begin your insecticide spray program promptly after petal drop to control overwintered curculios and catfacing insects. Horticultural oil is an ecologically friendly way to handle many garden problems. Here's the difference between dormant, summer, and all-season oil. Narrow range oils are lightweight oils, either petroleum or vegetable based. They are used in both horticulture and agriculture, where they are applied as a dilute spray on plant surfaces to control insects and mites. They are also sometimes included in tank mixes as a surfactant. Horticultural oils are usually applied in winter to early spring, after leaves drop in the fall and before buds break, to control San Jose scale and white peach scale, as well as overwintering mites. Read and follow the label carefully to avoid injuring plants. Avoid applying horticultural oil sprays when temperatures are below freezing or are likely to drop below freezing for the next 2–3 days. Bonide All Seasons Horticultural Spray Oil and Ortho Volck Oil are two examples. Chemical pesticides are often used to control diseases, pests or weeds. Chemical control is based on substances that are toxic (poisonous) to the pests involved. When chemical pesticides are applied to protect plants from pests, diseases or overgrowth by weeds, we speak of plant protection products. It is of course important that the plant that needs protection does not itself suffer from the toxic effects of the protection products. Biological control is no fad. In China in the fourth century B.C., ants were used as the natural enemy of pest insects, and in South China today ants are still used to control pests in orchards and food stores. The usefulness of parasites was discovered much later. Most parasites are insects, such as parasitic wasps (Encarsia formosa), which during the egg, larva and pupa stages live in or on a host. The complicated life cycle of these insects was first described in the early 18th century by Antonie van Leeuwenhoek. However, it would be many years before their potential use in pest control was discovered. In 1800, Erasmus Darwin, the father of Charles Darwin, wrote an essay on the useful role that parasites and predators may play in combating pests and diseases. Microbials can also be used preventively because they can make the plants healthier and stronger. When this happens, plants are not attacked by pests or diseases or are affected less by them. This kind of pest control is not visible.